Shower caps haven’t seen much innovation since your grandma’s time. Virtuosa’s adjustable shower cap changed that with its durable, double-ended design. It fits all of your hair—no matter length or style—and won’t crush or dent it. And this shower cap is made to last in Fall River, Massachusetts. The waterproof, breathable fabric protects your hair without making your scalp too hot. The cap is machine washable, too. 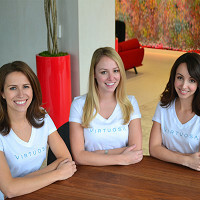 Founders Tamara Zagorovskaya, Alexandra Holtzman, and Caitlin Palmer met at Harvard Business School. They agreed that styling their hair every day took too long. Together they created Virtuosa to spend more time on the things that mattered. To use Virtuosa, pull it around your neck and sweep your hair out from underneath. With the loop in front, raise it up to your forehead and gently lift the other end until all your hair is inside. Cinch it closed and secure the toggle through the front loop. We like that this shower cap is head and shoulders above the disposable ones. Now you can easily extend the life of your salon visit or just go longer between washes for healthier hair. Hello everyone! I'm proud to introduce Virtuosa to The Grommet. I'd be happy to answer any questions you have! The shower cap has been around for decades, where did you see an opportunity for improvement? All of us had tried traditional shower caps in the past, but didn’t use them as part of our beauty routine because they were annoying to put on and ruined our hair. Your hairline gets wet around your forehead the nape of your neck, the non-breathable material traps steam under the cap and makes your hair frizzy, and how can you preserve your style when you have to tie or clip your hair up to get it under the cap? 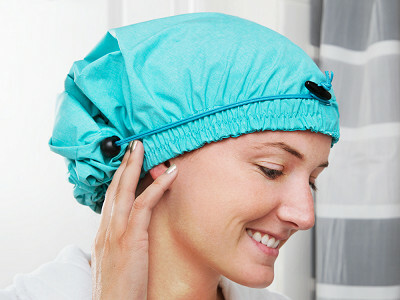 We completely reinvented the shower cap to solve all these issues and more! How did you settle on the design? Is that something that evolved over time? The three of us had a brainstorming session where we talked about what we didn’t like about existing shower caps, and played around with fabric to see how we could create a design that actually worked. We hired a fashion designer to translate our ideas to paper, and then worked with a talented seamstress to create the first prototypes. Dozens of women tested the prototypes and gave us feedback, which we used to refine the design until we felt it was perfect. What has been the feedback from people using it? We’ve gotten great feedback! We’ve heard from so many women who had completely written off shower caps before hearing about and trying the Virtuosa shower cap. Some love it because they can extend their blowout for a day or two, some love it because it doesn’t make their curls frizzy, some love it because it saves them time in the morning. And the #1 comment we get is: "Wow - this actually kept my hair dry!" @Alexandra this is such a great idea. It would also be very effective with curly hair and as a sleep cap. Many natural curley headed girls, of all races like to sleep with their hair in a satin bonnet. This protects from friction on the pillows. Some us satin pillow cases, which is not enough protection for many curly heads. So many sleep bonnets ( and I have quite a few) don't stay on the head thru the night. This design just might be the ticket for us! Maybe you could try it in a satin fabric, I'll be your Guinea pig. ???? @Carla Thanks for the awesome idea, Carla! I have very curly hair myself and use a satin pillow, but you're right - sometimes it's just not enough. We will definitely add this to our list of potential new products. Great idea from Carla. I, too sleep in a satin cap because of my curly hair and have trouble with them coming off sometimes. I would be all over this product if I ever saw it come out! Why should anyone with long hair choose Virtuosa over any cap? The Virtuosa shower cap is especially fantastic for women with long and/or thick, textured hair. Our design enables all lengths and types of hair to fit in the cap, with no need to tie or clip hair up. No matter the length, you can keep your hair down in the Virtuosa shower cap! This means no creasing or denting - your hair looks exactly the same after the shower as it did before. It’s the perfect solution for women with long hair who not only want to keep their hair dry in the shower but also want to keep the style perfectly preserved. I do have waist length hair that is very thick. (And, prone to frizz!) What I don't understand is how to use this without first putting my hair in a pony and then twining it and using a clip on top. How does this work? Also, the price seems high for a shower cap. The cap has two openings and pulls up over your face the same way a headband would. Once the headband is secured, the sleeve with the opening will be laying on your back/shoulders. Tussle it a bit by lifting the opening up and all of your hair will fall in, then pull the drawstring closed. My cofounder's hair is very long as well, longer than the dimensions of the cap, but it all still fits! In fact, many of our customers have said this is the only cap that will fit their hair. The cap is machine-washable and made to last for years, which makes the price well worth it! Think of all those flimsy caps you've had to buy over the years. It has proved to be a great investment for many of our customers. This would be good for people with dreads. I immediately thought of a friend with them when I saw this. @Wanda I totally agree. Thanks for the tip! We will be keeping that in mind for our plans to reach and serve new customers. @Alexandra & @Wanda, I have locs and my hair is too long and heavy for a traditional shower cap. I have the Big Hair shower cap that i'll use in a pinch but usually i take a neck gaiter (like a very wide headband) and tie the ends to keep my hair in and keep my edges flat not only when I'm in the shower but also at night to keep my hair smooth. The only downfall in the shower is the gaiter is not waterproof. I definitely would love to see this with the elastic edge but in a satin material for bedtime. @Gina Many of our customers with hairstyles that didn't fit well in regular shower caps used to improvise by using towels or t-shirts to wrap their hair in the shower - sounds similar to your strategy! Let me know if you try the Virtuosa shower cap. I think it would work well for you because the material is strong and the drawstring/cord lock mechanism on the bottom secures even long, heavy hairstyles. And another vote for making our design in a satin material for bedtime - thanks for the feedback! We will definitely keep this in mind for new products. How long is this shower cap expected to last, since it's pretty pricey? @Alyce it is machine washable, and is made of premium fabric that it is made to last the way you would expect your clothing to! I have had mine for 15 months so far and wash it probably every month or two and it is still in excellent shape - no fading. Katherine here from The Grommet team. I was a tester for Virtuosa and absolutely loved the cap. I have long hair and typical shower caps rarely fit all of it. Virtuosa covered all my hair and kept the style intact. @Katherine I'm so glad you love it! I love using mine so I don't have to wash my high-maintenance curls more than a couple of times a week - it saves me hours. My co-founder loves hers since she has fine hair and it gets creased easily. The design lets her keep her hair down and fall naturally so it looks exactly the same as it did before she got in the shower. I have a different issue, but this cap may be helpful. I have a short hairstyle and the top is styled to have some height while the back and sides lay flat against my head. In the winter I have a hard time keeping my head warm when walking outside without destroying my hair style. Would there be enough warmth in this cap to protect my head in outdoor winter use? @Kathy Hi Kathy - while the intended use of the cap today is for the shower, I agree the shape may help with your issue. It is made from materials with similar properties as a rain jacket would have, but to make sure it is an effective shower cap that doesn't trap heat inside and frizz your hair, the material is breathable. I don't think it could give the same warmth as a classic winter hat, but it will certainly help to shield your hair from the elements. @Gabrielle Absolutely! It will help you keep your hair healthy, and you'll get a couple hours back during the busy work week. Thank you for your support! Would the weight of it be too heavy to say, hold your hairstyle from crushing it? @Kay Great question! The material is light-weight, which allows it to breathe. Our customers have given us great feedback on this aspect. In fact, here is a direct quote in a recent customer survey we did: "I have short hair so what I really like is that my hair is not "sweaty looking, wet and matted" to my head like it would be after using a conventional shower cap. I run the brush through my hair and it's perfect!" They have also mentioned they love how light-weight it is, since it is easy to travel with and portable to pack. Great idea. I don't have long hair but I do use a few velcro rollers to help keep my hair styled. Do you think this would work as well with hair rollers? @Barbara as long as the rollers are a reasonable size, they should fit in the sleeve of the cap. One thing to consider: if the elastic part does not expand large enough to fit around your head with the rollers on, consider pulling the cap on around your neck before putting the rollers in. @Alexandra Thank you...one more question. The dimensions are 7" x 4"x 1.5"? That somehow doesn't sound right. Am I missing something? @Barbara The shower cap is delivered to you neatly folded up with a ribbon, and those are the dimensions of the folded cap! You can get a sense for the cap's actual size in the video and photos - it's long enough to fit virtually any hair style. 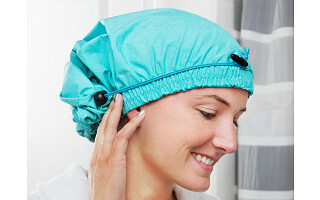 This "Shower Cap" covers the ears and part of the neck. How are you supposed to wash your ears and not get your hair wet? @Cheryl Some of our customers tuck the cap behind their ears after it's in place, to be able to wash there while still keeping their hair perfectly dry! I was struggling with trying to stuff my hair in a shower cap just this morning! The longer it gets the more frustrating it becomes. I love this solution. @janice As someone with long hair, you'll love the Virtuosa shower cap! Once you familiarize yourself with it, you'll find that it's so much easier than struggling with a regular cap. And it doesn't mess up your long hair! This would sell quickly if it were in shelves in hair salons! The stylists could show customers how it works and how it could protect that expensive service they just had done in the salon. I'm sure that's the goal, Sue! I'm sure our Wholesale team is keeping an eye on today. What a great idea! I have a keratin treatment in my hair so I'm not supposed to wash it every day. I hate how I have to clip my hair up to be able to use a regular shower cap. Is the cap light enough for me to wear in the pool since the pool chemicals can't touch my hair? @Mari Lee Thanks for your interest! The Virtuosa shower cap would be perfect for extending the length of your keratin treatment. I occasionally have straightening treatments done at the hair salon, and this cap really helps me preserve the style. The material for the cap is waterproof, but the cap design is not watertight. So this product would prevent splashes from ruining your hair, but wouldn't keep water out if you submerged your head in the pool. This is a new use that we hadn't considered - thanks for your creativity! Do you think this would work in a pool as well to help preserve my highlights? I have waist length hair so a swim cap won't work but I think this may. Thanks. Great product! @Stephanie Thanks for the question, and wow, you're the second person with the idea to use the Virtuosa shower cap in the pool! The material for the cap is waterproof, but the cap design is not watertight. So this product would prevent splashes from ruining your hair, but wouldn't keep water out if you submerged your head in the pool. Hopefully this is helpful! I see there is no color choice........ I would love one in gold color to match my gold, white & crystal bathroom...Even WHITE would have been a neutral color that could fit anyone’s bathroom.......so I’m wondering why you chose this, very specific, and somewhat limiting color choice, for those of us who want to ‘color coordinate’ our bathrooms? @Rosalind Thanks for your question! We chose Tiffany blue as our brand's signature color for the first set of Virtuosa shower caps. Our premium waterproof and breathable fabric was custom-made and we could initially only select one color. However, we have plans to offer other colors in the future, and we'll take into account your feedback for a more neutral shade! I was also wondering about color choice and agree a gold would be nice or dark taupe (ok, I'm not a blue person). Also what is this lined with? @Nora Thank you for your feedback on color choices! The soft polyester is coated on the inside with a thin layer of vinyl-like material. This makes the cap waterproof and breathable at the same time - it repels water droplets but doesn't trap steam on the inside. You described a problem with traditiinal shower caps as "your hairline gets wet around your forehead the nape of your neck...", yet the Virtuosa cap is not watertight. How does it prevent this problem? @Pamela Hi, thanks for your question! The Virtuosa shower cap is not watertight if you were to submerge your head underwater, but it repels streams/drops of water (like in the shower, or even outside in the rain). As long as the waterproof elastic headband covers your hairline, your hair won't get wet in the shower! And because of the way you put the Virtuosa shower cap on - pulling it back over your hair like a headband - it's easy to make sure every strand of hair is securely in the cap. I would take this with me when I get a massage. My long hair gets in the way of the massage therapist, clips are uncomfortable, and the massage oils get in my hair as well. That's another great use, Kimberly! @Kimberly Great idea! I think the Virtuosa shower cap would work well for facials and other spa services, too. Shower caps haven’t seen much innovation since your grandma’s time. Virtuosa’s adjustable shower cap changed that with its durable, double-ended design. It fits all of your hair—no matter length or style—and won’t crush or dent it. And this shower cap is made to last in Fall River, Massachusetts. The waterproof, breathable fabric protects your hair without making your scalp too hot. The cap is machine washable, too. Founders Tamara Zagorovskaya, Alexandra Holtzman, and Caitlin Palmer met at Harvard Business School. They agreed that styling their hair every day took too long. Together they created Virtuosa to spend more time on the things that mattered. To use Virtuosa, pull it around your neck and sweep your hair out from underneath. With the loop in front, raise it up to your forehead and gently lift the other end until all your hair is inside. Cinch it closed and secure the toggle through the front loop.